We all have memory lapses. According to my wife’s memory, I don’t remember much. She remembers things I’ve done and said that I have no recollection ever happened. I probably could live my entire life over and it would all be new to me. It’s so easy to forget. That is why our forefathers erected memorials to remind us of a sacrifice that was made. Most small towns have monuments to their citizens who died in service to their county. They are erected in prominent places that are obvious to those who pass by. Those memorials remind us of the past. Do you realize this is an ancient practice? Of course, we can think of the Egyptian pyramids, but God instructed Joshua to build a memorial long ago. In this passage, God instructs Joshua to have the people build a monument of 12 stones from the riverbed of the Jordan River, representing the 12 tribes of Israel. God knows human nature and that Israel’s memories would fade. The stones would be a memorial to remind their children that God had held back the waters of the Red Sea and the Jordon River until they had passed through on dry ground. God wanted them to remember Him and what He had done for them. A memorial is something that helps future generations remember the past. Sometimes a day of the year is set aside to remember a person or an event. 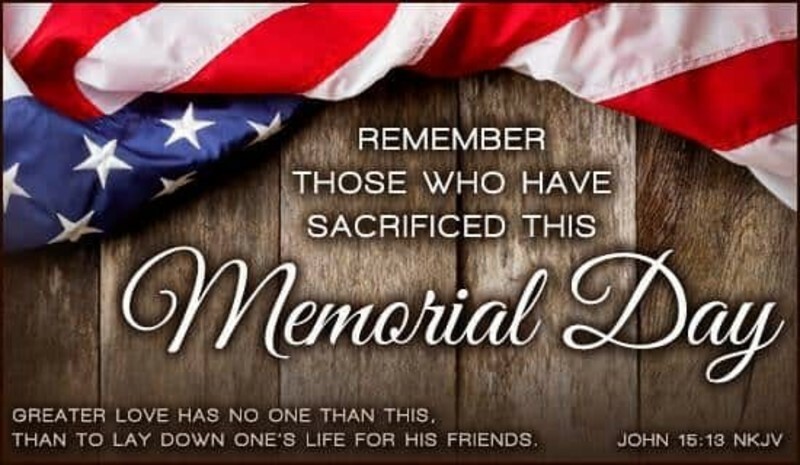 For example, Memorial Day, originally called Decoration Day, is a day of remembrance for those who have died in service of the United States of America. In my opinion, this includes policemen who have been killed in the line of duty. Unfortunately, many people do not reflect upon the past during this holiday any more than they do on any other day. In our age of ever-accelerating change, we tend not to look to the past to find our wisdom. We view what "has been" as largely irrelevant to what is now. Past heroes are not our models. We place little value in traditions or the Holy Scriptures. And so when Memorial Day rolls around, people’s thoughts do not automatically turn to the past and to those who sacrificed their lives so we can enjoy what we have today. This is extremely unfortunate, for those who do not learn from the past are doomed to repeat it. God knows how forgetful we are. So He gave us His written word. The first words recorded were written on stone by the finger of Almighty God. We call them the Ten Commandments. God commanded us to remember them and warned what would happen if we forgot or ignored them. Deuteronomy 8:18-20 You shall remember the LORD your God, for it is he who gives you power to get wealth, that he may confirm his covenant that he swore to your fathers, as it is this day. And if you forget the LORD your God and go after other gods and serve them and worship them, I solemnly warn you today that you shall surely perish. Like the nations that the LORD makes to perish before you, so shall you perish, because you would not obey the voice of the LORD your God. Unfortunately, Israel did forget the blessings of God and His Word, and they suffered the consequences. Likewise, we forget to read God’s Word and do what He commands for our blessing. There are always consequences when we forget or ignore His Word. We repeat the same mistakes. We turn to the wrong places for answers. We seek solutions in programs and people rather than God. We become comfortable and selfish. We become greedy and demanding. We become hateful and unloving. As a result, we see our lives and our nation beginning to perish. God knows how forgetful we are, but God has never forgotten his children, even when they suffer the consequences of forgetting Him. Neither does He forget what we do in service to Him. Furthermore, God reminds us how precious we are to Him every week through the Lord’s Supper. It is a continual memorial. Jesus began this memorial when he said: “Do this in remembrance of me.” We are to remember: Jesus loves us so much that He sacrificed His life in order that we might have life and have it abundantly. As we receive the elements of the Lord’s Supper each week, the loaf and the cup remind us of the sacrifice that was paid for our spiritual freedom. We were bound, condemned, and imprisoned by sin, but the blood of Jesus has set us free! Because God knows how easy it is for us to forget, He gave us the Lord’s Supper as a memorial to remind us that Jesus suffered and gave His life to purchase our freedom – to redeem us and set us free. John 15:12-13 This is my commandment, that you love one another as I have loved you. Greater love has no one than this, that someone lay down his life for his friends. Imagine taking someone else’s punishment and dying in their place so they can go free. Would you do that for a sinner? Jesus did. May we never forget that, and may we always live for Him! We can worship, honor, and live for Christ, by becoming living sacrifices, obeying Him, and loving others as He loves us. Romans 12:1-2 Therefore, I urge you brothers, in view of God’s mercy, to offer your bodies as living sacrifices, holy and pleasing to God, this is your spiritual act of worship. Do not conform any longer to the pattern of this world, but be transformed by the renewal of your mind. Then you will be able to test and approve what God’s will is, his good, pleasing and perfect will. This is the highest purpose for our lives. On this Memorial Day weekend, I want to remind you that God and people are more important than material things. And they are more important than our own personal fun and pleasure. Therefore, take time to remember and reflect on God and people of the past and people in the present. Many people have contributed to our lives and we need to remember them. This Memorial Day weekend, we need to look back and remember our deceased veterans and our deceased loved ones. Let’s remember the good things about their lives, the good faith they demonstrated and the good times we had with them, and thank God for them and for their sacrifice. Then, we must remember those around us and love them while we still can. Look beyond your selfish interest! We need to love the people around us. Look around right now. Col. 3:12-14 Therefore, as God’s chosen people, holy and dearly loved, clothe yourselves with compassion, kindness, humility, gentleness, and patience. Bear with each other and forgive one another if any of you has a grievance against someone. Forgive as the Lord forgave you. And over all these virtues put on love, which binds them all together in perfect unity. We all have family members, friends, fellow workers, neighbors, etc. who need our love. What loving things can we do for them? Small deeds or large, our love needs to be demonstrated while they are living. They are more important than material things, careers, pleasure, or money. I heard a story about a prankster who broke into a large department store and switched all the price tags. Cheap items were priced at thousands of dollars while expensive items were priced at only a dollar or two. This is exactly what the Devil has done to confuse people on earth and I might add, he has succeeded quite well! He has switched the price tags on us! We give too much to worthless things. People are what is precious. They count in life. Material things and pleasures don’t count in the end. Remember what is important! We’ve all been embarrassed by our own forgetfulness. I hate forgetting a person’s name, but I do it often, even immediately after they are introduced to me. That is awfully forgetful! However, the worst forgetfulness of all is to forget the Lord! So, don’t forget to honor Him on this Memorial Day weekend, and every weekend, for that matter! If anybody should be remembered at any time, it should be our Mighty God! Matthew 22:37-40 Jesus said to him, "'You shall love the LORD your God with all your heart, with all your soul, and with all your mind.' This is the first and great commandment. And the second is like it: 'You shall love your neighbor as yourself.' On these two commandments hang all the Law and the Prophets." James 1:17 Every good gift and every perfect gift is from above, coming down from the Father of lights, who does not change like shifting shadows. Ingratitude fosters forgetfulness. Therefore, we need to be thankful to God for every blessing He gives us, large and small. And of course, our greatest blessing is our salvation in Christ. Without Christ, there would be no hope for any of us. On this Memorial Day weekend and every weekend and every day, for that matter, we should remember the Lord and give thanks for everything. Remember what’s important. It is so easy to be so concerned about ourselves—our desires, our goals, our wishes, and our problems—that we take no thought of anyone else, nor of God, nor even our own future destination. Regardless of our status in life, we all have one of two eternal destinations, Heaven or Hell. Have you given much thought about that? You can know the answer to that last question today. You can be sure that when you leave this body of flesh, you will be welcomed in Heaven. But there is only one way, and it is not by your good works done in the body. No, it doesn’t matter how good or evil you have been. Jesus is the only way for anyone to be welcomed in Heaven. Therefore, make Jesus Christ your Lord and Savior. Believe that Jesus Christ is the Son of God who died for your sin. Repent of your sin and give your life to Jesus by confessing Him as Lord and being baptized. Then you will be born again of the Holy Spirit to live eternally in Heaven.